Acura is running “Transactions”, a commercial featuring Jerry Seinfeld and Jay Leno, during the third quarter of the 2012 Super Bowl game. Seinfeld and Leno, both known as car collectors, engage in an unrelenting bid to be the first in line to take delivery on the first Acura NSX. The Super Bowl campaign includes a pre-game release of a 1-minute 50-second—extended version of “Transactions,” PR initiatives, search, seeding and paid media placements. The commercial will be featured in Acura dealerships across the country. In addition, as the preferred vehicle of W Hotels, the commercial will be shown in-car on the MDX’s rear-entertainment DVD screen during guest rides. 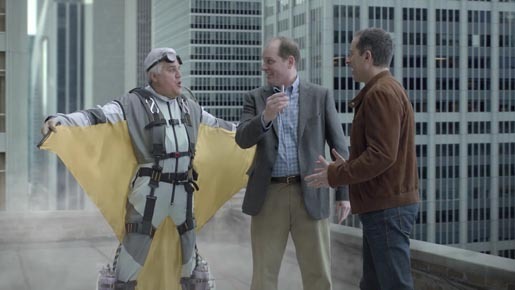 The Transactions campaign was developed at RPA, Los Angeles, by executive creative director John Hage, head of art Phillip Squier, associate creative director/copywriter Jon King, art director Brian Hall, executive producer Jack Epsteen, along with production writers Jerry Seinfeld, Barry Marder, Chuck Martin, Spike Feresten and Bob Einstein. Filming was shot by director Craig Gillespie via MJZ with director of photography Emmanuel Lubezki. Visual effects were produced at Eight VFX. Editor was Kim Bica at Arcade Edit. Sound was designed at Mit Out Sound by sound designer Ren Klyce.